An Idiot Abroad debuts on The Science Channel tonight, with a preview airing at 9:30 p.m. Eastern and the first episode airing at 10 p.m. Eastern. Is there a TV format as hidebound as the travelogue? Don’t get me wrong. I enjoy a great many of these types of shows, but there have been precious few changes to the basic format of “interesting person goes to another country and wanders around, talking about what he or she sees” over the years. Thus, the travelogue relies heavily on the personality in front of the camera. Anthony Bourdain can definitely make a show like this work. The nerdy, always looking for a bargain Rick Steves can, too. But the cable show cemetery is littered with the graves of travelogues that ended after just one season, shows that didn’t have a host capable of holding the audience’s interest, leading everybody to change the channel. On paper, a travelogue SEEMS easy (and cheap) to do. In practice, it’s much harder. The question, then, is if Karl Pilkington is the right guy to build a show like this around. Now, it’s doubtful there will be more seasons of An Idiot Abroad, so that immediately takes some of the pressure off of him as a host. The round-headed, dim star of The Ricky Gervais Show (and the podcast that became it) is sent on a mission to visit the Seven Wonders Of The World by “friends” Gervais and Stephen Merchant, who want to see if the experience of visiting exotic places will change Karl at all, or if he’ll remain the same, small-minded, dim-witted fellow he’s always been. (For purposes of this review, I’m going to assume Pilkington is as stupid as presented, rather than the whole thing being an act, since that’s what the show wants me to assume, and it gives me no reason to suspect otherwise.) He begins his journeys in China, where he’s been sent to see the Great Wall, and the episode then mostly turns into Karl Pilkington wandering the streets of assorted Chinese cities, saying random things about everything he sees. This works better than it has any right to. There are points where the series seems rather like going to some sort of tourist attraction with your cranky dad, who hates that he had to pay so much to get in and bemoans everything he sees as not authentic or not good enough. But there are also moments of sublime hilarity, as when Pilkington comes across an enclosure filled with bears near the Great Wall and theorizes as to what they might be doing there or when Merchant and Gervais call Pilkington to give him a new assignment and Pilkington’s eyes turn more and more downcast. There’s some funny, funny stuff here. Furthermore, because the primary attraction is Karl and his journey, rather than the places he visits, the show is able to get more wide-ranging than most travelogues. Many series would just send the host around to China’s chief tourist attractions, concluding with the Great Wall. Karl, instead, spends plenty of time wandering weird Chinese back streets, questioning the setup of the bathrooms he finds, and wrinkling up his nose at the variety of things he can eat on a stick at a local street market. There’s an element of formlessness to this that can make it a bit enervating. You have to REALLY LIKE Pilkington and find him REALLY FUNNY for large swathes of this to work, and even big fans of Pilkington and his shtick are likely to have their patience tested by some of these bits. There’s nothing wrong with any of this, but there are moments when it seems like it might work better as a half-hour show than an hour-long one. (Science Channel only sent out the Great Wall episode for review, so maybe this problem works itself out as the series goes on.) Furthermore, Pilkington is such an idiot that many of his pronouncements could seem slightly offensive, if not for the fact that it was this round-headed lummox saying them. There’s a fine line between laughing at an offensive statement and laughing at the person saying it, and An Idiot Abroad occasionally takes a step or two over that line in the wrong direction. On the other hand, there’s plenty here to be entertained by all the same. 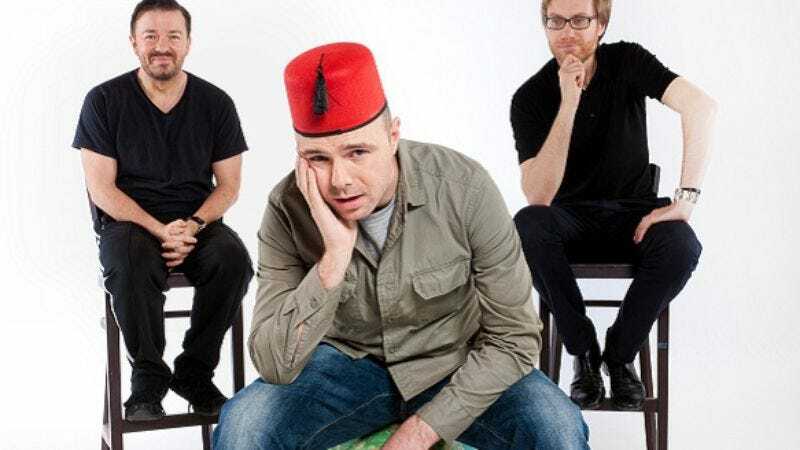 Gervais and Merchant are suitably cruel task masters, and the various chores they come up with for Pilkington to perform are always a great opportunity for comedy. Sending Pilkington to talk with a fortune teller (which results in a lengthy monologue about why you’d ever bring a kid to a fortune teller, for some reason) turns out to be fitfully amusing, but trying to get him to learn kung fu is even better, resulting in one of the best inadvertent punchlines to a scene like this in quite some time. An Idiot Abroad has its problems, but so much of it is hilarious and so much of it is surprisingly wide-ranging that it becomes worth checking out all the same.